Hello, My name is Patches (or something) and my owner, Dunstan Orchard has gone mad. Well I've found out who's to blame for all the videos crossing my video feeds of puppies. Apparently it all started on the 14th of January when the dog of prominent blogger and designer Dunstan Orchard of 1976design.com, Poppy, gave birth. Perhaps his descent into myopic puppy video blogging also has something do do with his somewhat recent appointment to Apple, Inc., but it's clear that Dunstan's creativeity and judgment have suddenly broken down as he has slowly worked himself up from photoblogging about nothing but puppies to now videoblogging about nothing but puppies, actually posting multiple videos a day. I must ask myself how an otherwise bright and creative individual can lose all judgement in the face of such horrific events. It's quite disturbing. What if we all did nothing but post pictures of our pets. What then? I ask that people try to restrain themselves such activity and make a call for the creation of rules governing this type of activity within the blogosphere, especially within the videoblogging community. It's stuff like this that's going to set video blogging and blogging in general back years. How will we ever gain the respect of our traditional journalistic counterparts and establish our merit withing the artistic community. Get a hold of yourself people. That's pretty cute. Well, except for the one mid-birth picture. It answers Mitch Hedberg's old question: Why are there no during photos? Mike, I'm really suprised that you have multiple video feeds of puppies. Isn't one puppy feed enough? Reminds me of The Puppy Channel. You need to get out more dude! 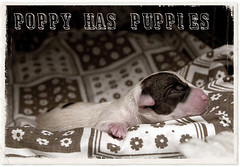 Awww... but the cute ickle puppies!!! Look, that ones got a brown nose! Yeah, I hope you are too, because if not, your post is the most ridiculous thing I've seen so far in 2005.